"To see this little seahorse — it's heartbreaking." It’s a photo that’s getting wildlife photographer Justin Hofman international attention. It’s also a photo that he wishes did not exist. While snorkeling off on island south of Borneo, in Indonesia, Hofman happened upon a tiny orange seahorse drifting in with the tide. But what began as a pleasing encounter with one of the ocean's most recognizable animals soon took a heartbreaking turn. Slowly but surely, pollution in the surrounding waters began to drift in as well — a wave of debris and waste left behind by humans that the little seahorse had no hope of escaping. "It was literally sewage; you could smell the water change. It was disgusting," Hofman recounted to The Dodo. "Eventually, this little scene unfolded in front of me." 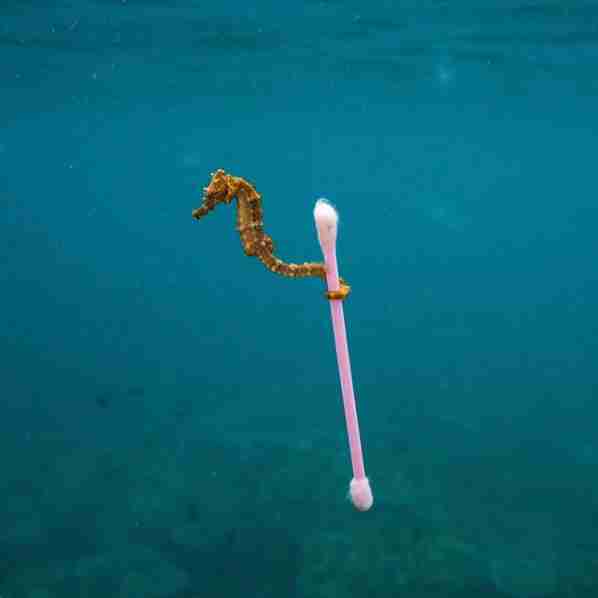 Now awash in floating litter, the seahorse moved from one piece of debris to the next — eventually clinging to a plastic cotton swab that had sadly found its way into her fragile habitat. "To see this little seahorse — it’s heartbreaking," Hofman said. "It’s a photo that I wish didn’t exist but now that it does I want everyone to see it," Hofman later wrote on Instagram. "What started as an opportunity to photograph a cute little seahorse turned into one of frustration and sadness as the incoming tide brought with it countless pieces of trash and sewage." Hofman's powerful photo has since gone viral and was selected as a finalist in the London National History Museum's Wildlife Photographer of the Year exhibition. Instead of acclaim for himself, however, Hofman wants the image to inspire a change in behavior on the part of all who see it. "I hope it helps people think about what they consume, choosing things that are paper instead of plastic," he said. "People might look at the picture and think, ‘We’re doomed.’ But if every person did their part, it would add up to a huge impact. 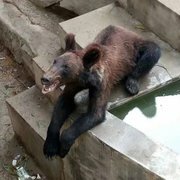 We can all not let our trash go down the drain. We can all put things in a trash bin and recycle. It’s easy." To keep up with the latest issues impacting the world's oceans, and learn how you can make a difference, follow SeaLegacy on Facebook.